MBC and I are partial to stories that have happy endings. Thus, we were pleased to read “A Home for Abigail,” with an ending made happier by knowing that it is based on a true story. 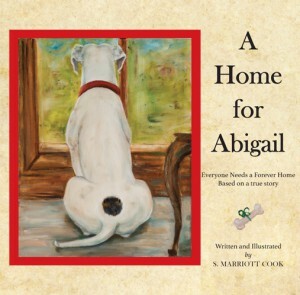 Written and illustrated by S. Marriott Cook, the nine chapters follow the journey of a dog named Abigail. A kind lady finds “Abby” alone and abandoned, in need of a “forever” home. Thus begins a new adventure for Abby and the delightful new friends she comes to know: Mr. Buns, Cosette, Chloe, Gus, News, and her new “Mom and Dad,” Sandy and Richard. The book is especially helpful in educating children about responsible pet ownership, including the need for spaying, neutering and microchipping. The interaction between the animal characters and their humans is humorous and delightful, woven together into a touching and inspiring story. “A Home for Abigail” was published by Jabberwocky Books www.Jabberwocky-Books.com and is also available on Amazon. Yet another book I’ll be putting on my Christmas wish list……hope you will, too!